Back in the 90s I studied, and then graduated, from the Glasgow School of Art before changing track slightly to complete an MSc in computer graphics. This led to 15 years of lecturing at several universities and colleges. 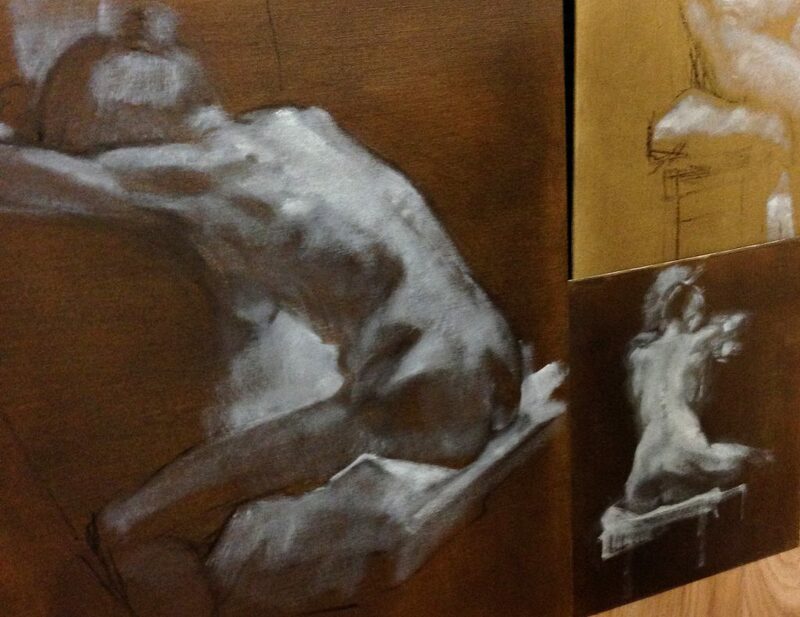 Throughout this time I was always drawing and painting for myself as a serious hobby. After a change of circumstances I decided that a change was needed and began to practice painting and printmaking seriously. I was practically self-taught as during my time at the Art School I wasn’t one of the chosen few who would be encouraged to paint so I studied the great masters and learned what I could from painters I aspired to such as Paula Rego, Georgia O’Keefe, Shawn Barber and portrait painter Tai-Shan Schierenberg. Although my customers were already delighted with my work at this point I personally knew that there was a lot of room for improvement and was delighted when I was contacted by one of the great Glasgow painters, Alexandra Gardner. She was looking for a new painter to mentor and, having already purchased some of my art, asked me if I’d like a little teaching. 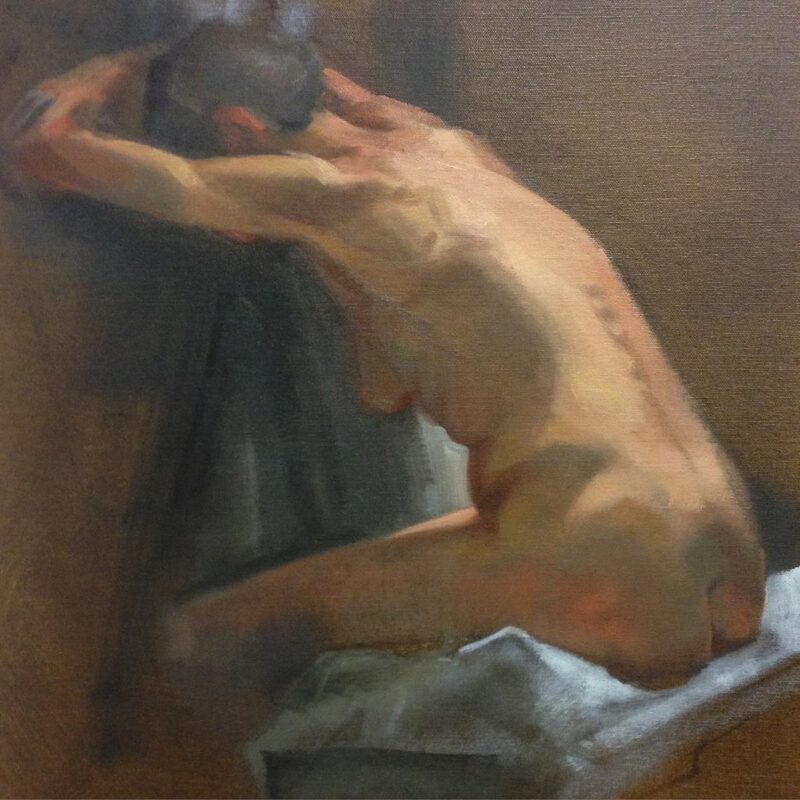 I jumped at the chance to refine my technique and subsequently spent many long days in her studio learning to look at paintings in a different way and apply oil paint in a much more expressive manner. I felt that my work was finally getting to a standard of which I felt was possible and continued painting with a renewed vigour. A few years later and we are up to the present time, and my reason for writing this post. Even though I have been painting professionally for 20 or so years I am always aware that I will continue to hone and refine my craft until I stop painting in the very distant future. Painting isn’t just something you can study for 3 years and then undertake without improvement – there is always something to learn. I have just finished an atelier painting course which has taken place over the past 6 months with the outstanding teacher Cynthia Bowles. Initially I thought I would take the course just to gain time with a form lit model in a large studio, but I quickly realised that there were incredibly valuable lessons I could learn by joining in with the taught elements. The first was an introduction to an earth colour palette based on Black, Burnt Umber, Alizarin Crimson, Raw Umber, Old English Red, Raw Siena and Yellow Ochre mixed into strings of tone using white. I usually use a circular arrangement of colour around the palette so laying out in rows was new for me. A simple change, perhaps, but life changing at the same time! The interesting development with this method was that shadow tones (the first three) contain little or no white, so shadow colours remain pure and less chalky. Changing a colour within a tonal range was easy as you just move down the column of colour strings. We were introduced to methods of priming boards, oiling out, using solvent and oils and grisaille underpainting, where a grey version of the painting is made to allow the pure colours to be laid on top, making the pale skin tones really sing out. 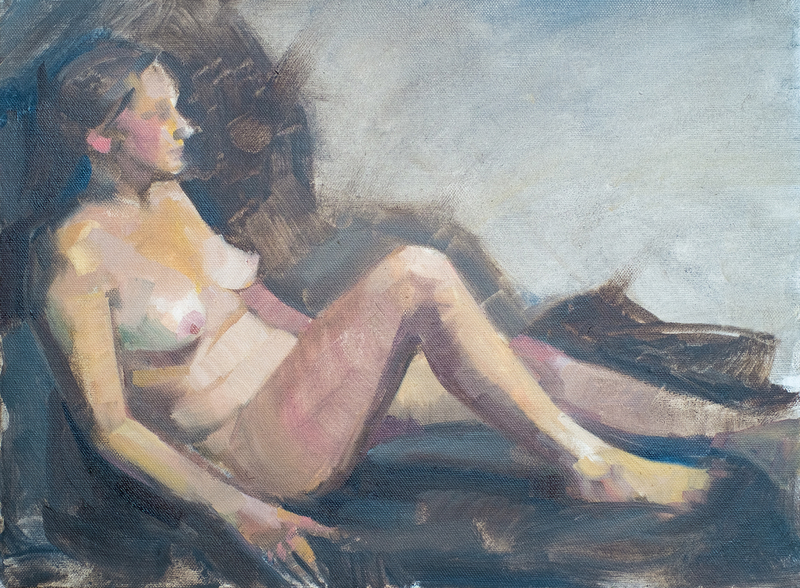 At first I worried that laying down a planned representation of the figure would stifle lively brushstrokes later on, which at first did happen, but as I worked through each session, I was able to be more and more free in how I applied the paint. 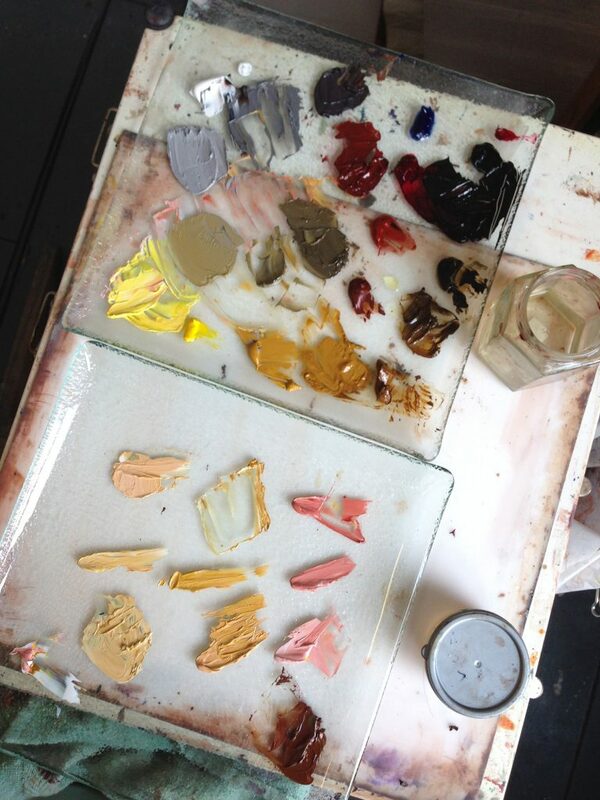 Being mainly self taught in oil painting, I tend to have had a more chaotic approach to mixing colour, often with over 15 colours on my palette. I love the liveliness that using lots of colours brings, but by limiting my palette for these months, I have found a new structure to my painting, which in particular has made my commissioned portraits more coherent as a set, as well as helping my series of personal paintings work as a progression of ideas, rather than looking like separate works. I am continuing with these principles as well as gently adding touches of my beloved colours like cadmium yellow, cadmium red and ultramarine into the mix. When I tell people about the courses I take, they look at me in surprise and ask why I need to be taught when my work, in their view, is so good already. I reply that in art you can always learn something from your peers and mentors. There are so many ways of doing things, so many possibilities, that it is good to open yourself up now again. Also painting in your studio can be a pretty lonely business, so to work with others, seeing their methods of work, be talking about art and sharing ideas is real food for the soul and an essential part of being a constantly developing artist. I will always be striving to be a better painter and printmaker, to be learning new techniques and practicing them, and making new friends who encourage and inspire with their knowledge and enthusiasm. I shall also strive to blog more often now that I have a fancy new website!